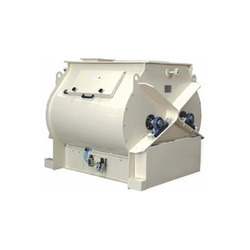 We are a leading Manufacturer of double shaft paddle mixer from Ahmedabad, India. We are engaged manufacturer and supplier of Double Shaft Paddle Mixer. To ensure that our offered Paddle Mixers are suitable for dry powder mixing, we fit these with ''U'' shaped trough, discharge valve, solid SS end plates, and SS shaft with specially designed paddles. Moreover, we couple shaft with heavy-duty gearbox and motor to enhance easy operation. Post Production, we check the offered paddle mixers to ensure their ability to meet the requirement of enlisted below application area. It is used for mixing dry powder, minerals and spices etc.